Cradled within a glorious range of mountains, is a sanctuary filled with pristine lakes, pine forests, abundant gardens, orchards and vineyards, sandy beaches and superb amenities. Stretching from north to south for approximately 135 km (84 miles) is beautiful Okanagan Lake. The lake sustains several diverse communities along this corridor known as the Okanagan Valley. The Okanagan Valley is a semi-arid climate, boasting long warm summers and short mild winters. The city of Kelowna is the largest community and is located midway through the valley. It has a population of 127,500 and is the transportation, business and service hub of the valley. Relatively undiscovered, Kelowna is never too crowded despite playing host to visitors the world over. The Kelowna International Airport, one of the busiest airports in Canada, easily connects to major North American cities. With daily flights, it’s just a 60-minute flight from Calgary or Vancouver and 70 minutes from Seattle. Daily direct flights to Toronto are also available. A variety of accommodations offer choices ranging from lakeside resorts to cozy B & B’s. Kelowna has miles of beautiful parkland and several sandy beaches which provide wonderful opportunities for boating, swimming, water-skiing, windsurfing and fishing. As well, you can hit the links at one of our many golf courses nine months out of the year. In cooler months, our snow-capped mountains and pine filled forests are a haven for skiers, boarders, snowmobilers and outdoor adventurists of all types and levels. That’s not all. 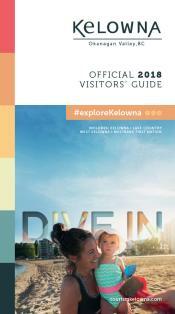 Kelowna’s growing Cultural District covers a six-block downtown area and features a concentration of galleries, museums, theatres, a casino, artists’ studios, fine dining, unique shops and a vibrant cultural life all year long. Prospera Place, a 6,000-seat multi-purpose facility that’s home to the Kelowna Rockets of the Western Hockey League, attracts major entertainers, events, and is also located in the heart of the city.